Alfred Darby was born in Clerkenwell, London, around 1856, the son of Alfred Darby (who was a Seaman by trade) and Emma Salmon. By 1861 the Darby family were living in Beccles, and lived at Rosemary Lane for over twenty years. Rosemary Lane is situated between Northgate Street and Ravensmere. 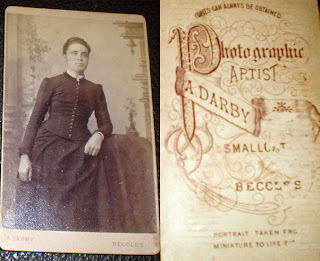 In 1871 Alfred Darby (jnr) was working as an Apprentice Photographer with William Edward Mills (see part one of this blog for more information about William Mills). In 1882 he married Laura Matilda Smith and they had six children, two daughters and four sons. The 1891 census return shows Alfred was living at Smallgate Street. The 1891-2 White's Directory and the 1892 Kelly's Directory both list Alfred as Photographer of Smallgate Street, Beccles. The 1911 census return shows Alfred Darby at 15 Smallgate Street, with his wife Laura and their three of their six children, including their son Claud, aged 19, who is: Photographer, Assisting Father's Business. 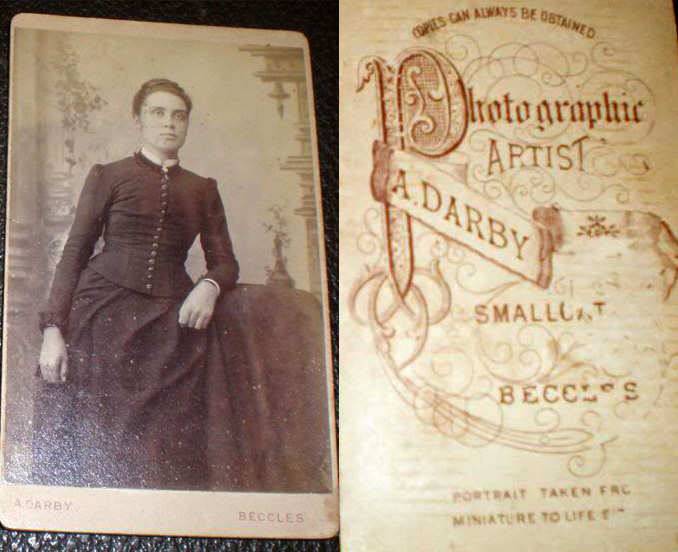 Alfred Darby is listed in the 1912, the 1925 and the 1936 Kelly's Directory as Photographer. DEATH of Mr Alfred DARBY aged 83, of 15 Smallgate. Born in London, Mr Darby came to Beccles as a child and spent practically all his life in the town. After serving his apprenticeship with Mr Mills, a photographer, he went to Bradford for a short time. He returned to carry on Mr Mills’ business and carried it on for about 60 years. Mr Darby was for some years a member of the old Volunteers at Beccles. He had belonged to the Beccles Adult School since it was founded in 1900. A lifelong teetotaller, he was a member of the local Tent of Rechabites (for more information read here). A widower for the last five years, Mr Darby leaves four sons and two daughters. One of the sons, Mr Claud S Darby, for some years has been the Beccles & Bungay advertising representative of our series of newspapers. 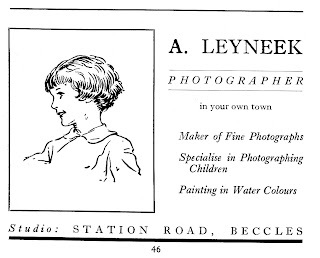 Hern Andrey Leyneek was born in Prussia in 1885. He came to Beccles in 1900 and established himself in a studio in New Market before taking over the business from Arthur Edgar Mount (for more information about Arthur Mount see part one of my blog). Sometime during the first decade of his life in England, he anglicized his name to Andrew. The 1911 census return shows Andrew Leyneek (written as H A Leyneek), Photographer, a boarder at the home of George Watson. George was a Grocer's Porter by trade. There are two very interesting things about the 1911 census. One is that Rosalie Mary Watson, his niece, was also at the Beccles address and the following year she married Andrew Leyneek at Beccles Church. The other interesting thing is that the address is given as 31 Station Road, Beccles. This would be Leyneek's address (and place of business) for the next forty years. "Being Summertime, there were plenty of cattle on the marshes bordering the Waveney on the Gillingham side of the town. When, on Monday evening water was creeping up, an effort was made by marsh-men to remove a batch of five store beasts to safety. Despite their persistent efforts, the cattle refused to budge, and finally had to be left to their fate. The next morning, a photographer, Mr A Leyneek of Station Road, happened to see the animals floundering about while looking at the flooded marshes from the Churchyard wall. Braving the danger, he borrowed a rowing boat and set out to get them to safety. It took some time, but he got them to swim towards the town side where they were eventually hauled ashore by willing helpers at the Puddingmoor boatyard of Mr Herbert Hipperson..."
ANDREW LEYNEEK’S NATIONALITY: "It seems to be quite an understood thing in Beccles, where I have resided for the last 14 years, that I am a German subject, but this is quite a mistake. I was born near Memel in Kurland, which is one of the three counties known as Baltic Provinces. The people are called Lettish. They speak their own language and have their own books and newspapers. In religion they are Protestants (like the Germans), but they are overruled by Russia, though the Baltic Provinces originally belonged to Sweden. My father and sister are still living near Riga." 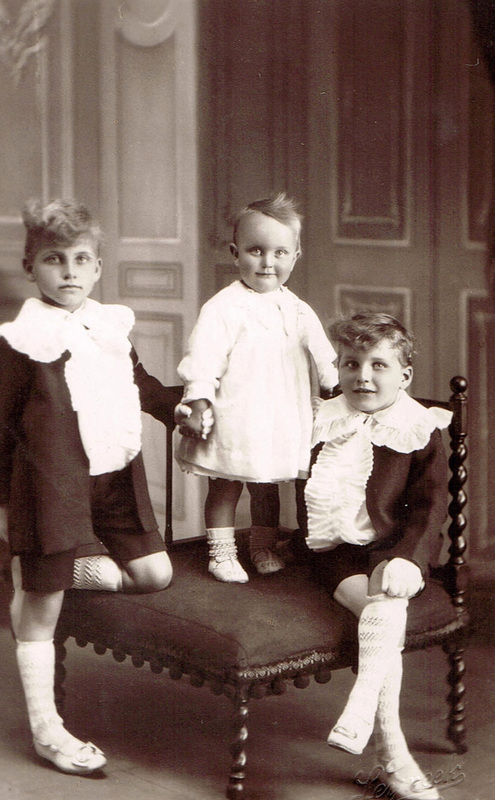 It is believed that Andrew and Rosalie Leyneek did not have any children and so it may seem fitting that photographing children became Andrew's speciality (examples shown below). Andrew Leyneek died on 9 April 1949 and in his will he left £1604 to his wife Rosalie and William Bryan Forward, a Solicitor in Beccles (who was the Town Clerk of Beccles, 1914-1947). 31 Station Road, Beccles remained a photographic studio until at least 1974. 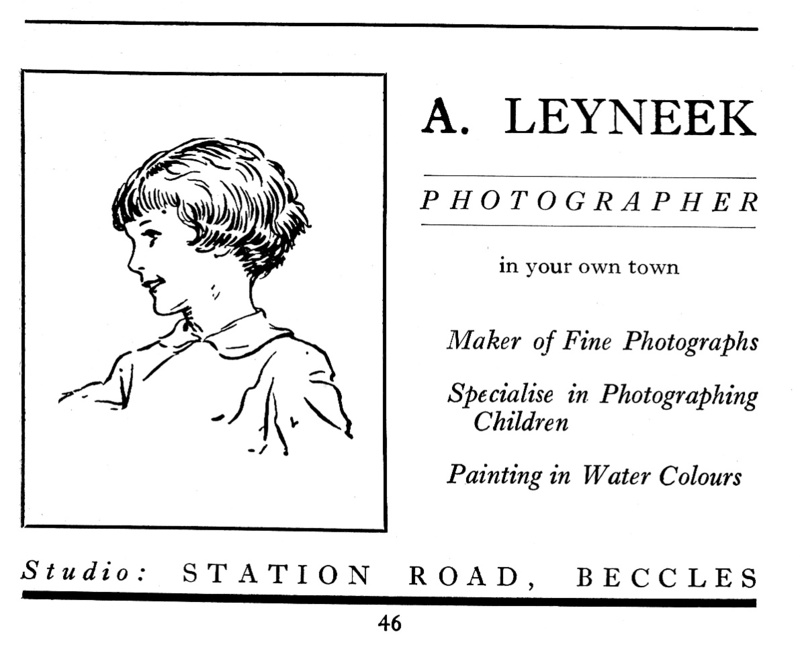 ADDENDUM: Thanks to an enquiry by a 'Relics of Beccles' Twitter follower, I was prompted to find out who took over the business after Andrew Leyneek died. It was Ludwik Karl Olanczuk (originally from Felixstowe) who, together with his wife, bought the business and premises from Leyneek's widow Rosalie for £1,950. I have a framed, signed sepia photograph of a sailing boat signed Leyneek, and I wondered if you are interested in it? My fathers name was a Ludwik Karol (not Karl) Olanczuk.